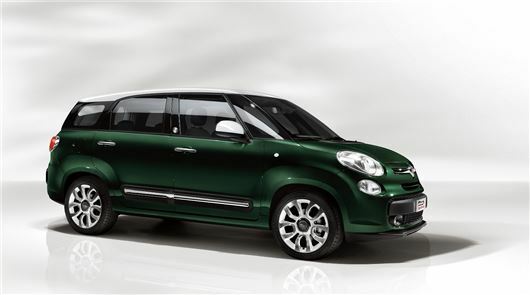 Fiat has revealed the sixth addition to its 500 family - the 500L MPW. Essentially a stretched version of the 500L, the new model will go on sale in the UK from September and sit above the current 500L range. Prices are still to be confirmed, but expect to pay in the region of £16,000. The 500L MPW (Multi Purpose Wagon) will be 200mm longer than the 500L and will compete with the Ford Grand C-Max in the compact MPV market. Fiat is officially labelling the car as a ‘5+2’, which suggests that the third row of seats will be strictly for children. Fiat will officially unveil the car next month, but we can confirm that it will be available with a choice of two petrol engines, a 95HP 1.4 and 105HP 0.9 TwinAir, along with two turbodiesels – a 85HP 1.3 and 105HP 1.6 MultiJet. There will be two trim levels to choose from - Pop Star and Lounge – with 19 different colours, including 11 two-tone combinations. Both trims come with the choice of five or seven seat, with the later folding flat into the floor to provide a load space of 638-litres. As you would expect from the 500 range, there’s a plethora of options to tempt your wallet, including full leather interior, integrated satellite navigation and a rear camera to assisting with reversing. The Fiat 500L MPW will be produced at Fiat’s new Serbian factory at Kragujevac and initially be available in Italy before being extended to the rest of Europe.